As a journalist and activist, I fully believe in the First Amendment –– freedom of speech, freedom of peaceful protest, freedom to petition, freedom of press. These are what defines me, a protester standing on the front lines against the Trump rally and Marsha Blackburn’s campaign. My friends and I first arrived on the scene to a massive line of hundreds, if not thousands of people, stretching from the entrance of the Freedom Hall Civic Center, down two streets and off into the distance. There was no way I was standing in line, not that anyone would let us. As soon as we stepped up to the sidewalk, a man told us to go to the back of the line, and promptly pointed to the street, perhaps telling us to leave, or otherwise pointing in the wrong direction. 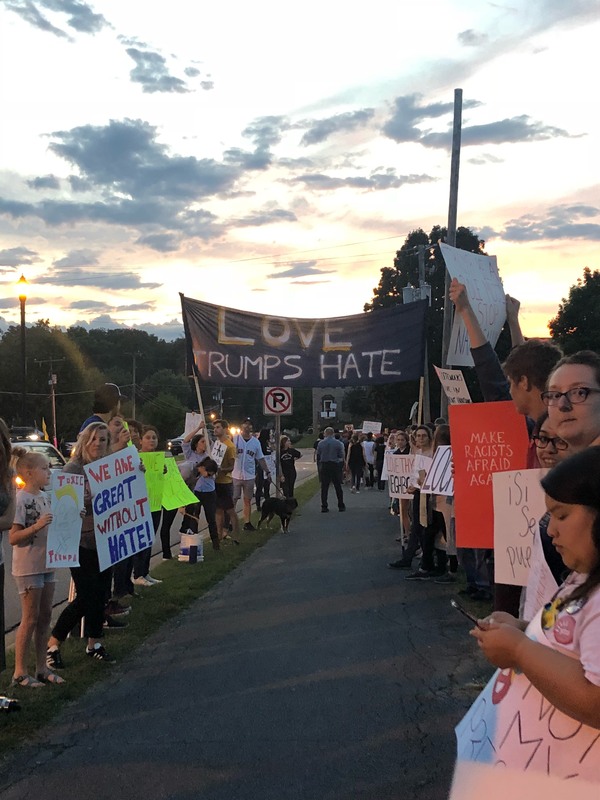 We took the streets and headed to the site where the Washington County Democratic Party was hosting the protest. Where I saw a sea of red immediately turned to hues of blue or neutral colors. 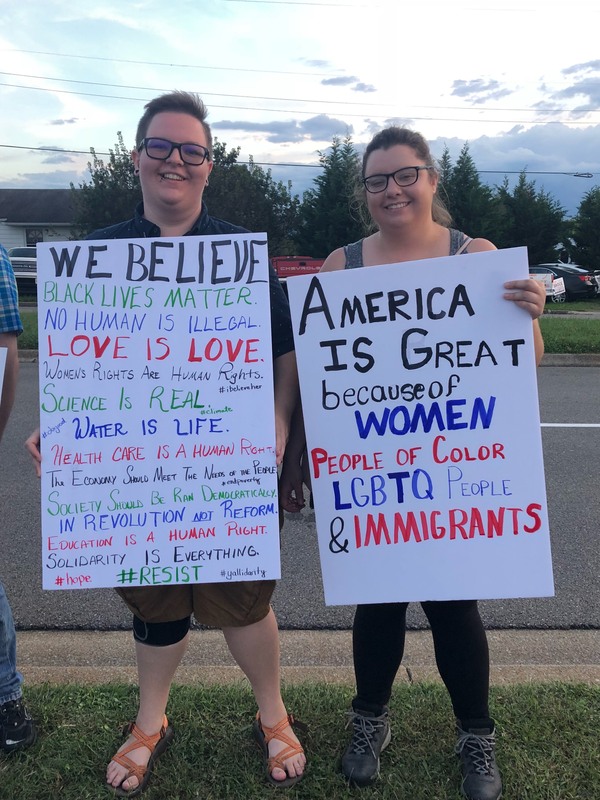 Men and women of all ages held signs in support of women’s rights, immigration, health care, environmentalism and LGBTQ rights. Other signs were in support of free election and the right to vote. As Trump supporters passed by the protesters, some walked quietly through, but others needed to voice themselves. 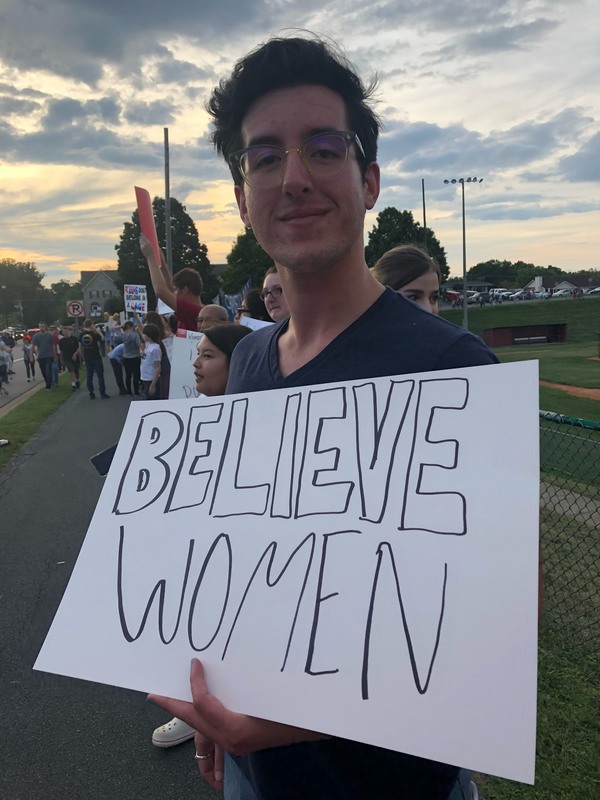 One called us “deplorable.” Several men walked by a “Believe Women” sign, and all of them said, “Not if they’re liars.” Other women tried arguing against the same “Believe Women” sign, which I find counterproductive. There were scant others who genuinely tried to start dialogue between opinions. These moments truly reflect American values: Voicing different opinions and giving room to understand other perspectives. At the protest’s end, my friends and I made our way to the jumbo screen where President Trump’s speech was playing live. I never agree with the man, so I won’t pretend I’ve changed my mind about him. Needless to say, I wasn’t impressed. The most notable part of his speech was when he threw out names of historical figures from Tennessee, such as Davy Crockett and Andrew Jackson. What Davy Crockett has to do with politics, I don’t know, and neither did Trump. Then he said he was a fan of Andrew Jackson, which is such a problematic statement I’ve heard come from a standing president, but I’m not surprised Trump supports a man who committed genocide, among other horrible atrocities Jackson did in his lifetime. I think what Trump supporters fail to realize is empathy. The protest wasn’t about party affiliation. Politics never should be about party loyalty. It’s about people and people’s rights. Since Trump has been against human rights since his campaign, why wouldn’t I protest his rally? I value the opportunity to protest the injustices I truly believe are taking place in America. All that’s next is to take your voices to the polls and vote the change you want to see.